1. Lightly spread the butter or margarine on the outside of your bread. 2. 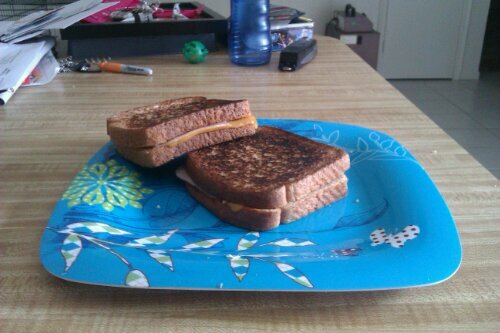 Place a slice of cheddar cheese down on one of the bread slices. 3. Cut one of the kosher pickle slices in half and then place them on top of the cheese. 4. Place a slice of ham on top of the pickles and cheese. Optional: grill the ham before hand to dry it out. Gives the sandwich a more crisp taste. 5. Cut a piece of cheese on half to top off your sandwich. 6. Place the second slice of bread on top and grill the sandwich until the outside is darkened lightly. There ya go! Another great Geek Recipe! Try it out and let us know what you think!